Politburo Member and one of Xi Jinping’s “New Zhijiang Army“. Education: Studied at Zhejiang Agricultural University, the Central Party School and Hong Kong Polytechnic University (Business Degree). Career: Li Qiang’s career has mainly been in successively senior roles in Zhejiang, where he would have served under then-Party Secretary Xi Jinping (as Secretary General of the Zhejiang Party Committee). 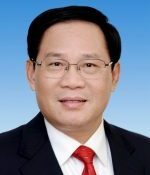 Governor of Zhejiang from 2013 – 2016, then Party Secretary of Jiangsu from 2016 – 2017 until this promotion. Prospects: Member of the 19th Politburo. An ally of Xi Jinping (accompanied him to the US in 2015). Almost all Shanghai Party Secretaries eventually join the Politburo Standing Committee and Li is young enough for promotion in 2022. Address: 200 People Avenue Post, 200003, Shanghai. This entry was posted in Profiles and tagged China, Chinese Communist Party, Party Secretary, Politburo. Bookmark the permalink.